We are Keen Software House, developers of Space Engineers and Medieval Engineers: Ask Us Anything! We are Keen Software House - developers of the video games Space Engineers and Medieval Engineers. We are here with a few members of our team and we will be answering your questions about our new title, Medieval Engineers, and our sandbox game, Space Engineers. The IAmA will be starting at 10:30 PST (19:30 CET). 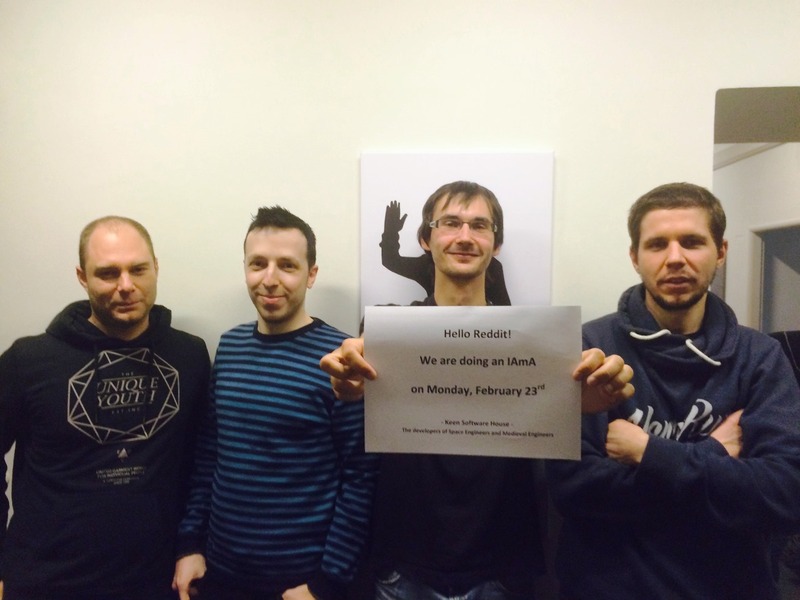 Answering your questions will be mostly Marek Rosa (CEO) – answering as KeenSWH - together with Ondrej Petrzilka (lead programmer), Tomas Rampas (lead artist) and Cestmir Houska (programmer). This is the proof that it’s really us :-): http://mirror.keenswh.com/Pics/KeenSWH_Reddit_02_23_15.jpg post on our Space Engineers Facebook page: https://www.facebook.com/SpaceEngineers/posts/400613036785664 post on our Medieval Engineers Twitter: https://twitter.com/MedievalEng/status/568826055718510592. We will be answering for approximately one hour since we start. We will do our best to reply to as many questions as possible, but please forgive us in case we miss some of them. This IAmA is about Medieval Engineers and Space Engineers, so please try to stick your questions to these as much as possible. EDIT: Thank you and good bye! The IAmA is now finished, see you next time. My question is - do you ever plan on hosting your own servers are any point? Player run servers are a great option, however I'd love to have the ability to play on more stable servers run by you guys and not have to worry about my hard work disappearing due to the admin dropping the server. What about console servers? Last thing - best pizza toppings? KeenSWH hosted servers are a good idea. We have considered SE MMO but it was just a brief idea, nothing we pursued for longer. It will be good if people let us know if they want this or not. Some advance or news about water? Will we see different environments (Desert, tundra) and weather types (rain, snow) in ME? Also day/night? Yes this would be cool. Rain and snow is probably harder to implement (from rendering point of view), but day/nigh is a sure thing. Hi Keen! Love your games but love your attitude to making games and how you listen to gamers even more!! Please keep doing what you do. Could you please add a spray-gun to the tools so we can paint our ships easier in SE? How long until we see multi-player in Medieval Engineers? EDIT: 3. Will we be able to control AI at some point in SE? i.e. AI crews for ships? ad 2) MP in Medieval Engineers - probably a few months. We will use netcode we already have in Space Engineers, but at the same time we are changing a lot of netcode to different library. In general, MP in ME will require less work than it did for SE because we already have the infrastructure and GUI part of it. Hi KSH! Have you thought about implementing any sort of campaign/challenges to Space Engineers? Where did you get the inspiration/idea for space engineers? Can we expect any improvements on character animations (Just the basic ones), and since you've considered oxygen and planets (Thank you! ), will you also be adding NPCs anytime soon? Like that nice April Fools thing you guys did. Character animation is one of the big things we are working on undercover... basically adding some inverse kinematics and ragdoll and in future maybe even more advanced stuff. Sorry, I meant NPC for ME, not SE. Should I expect rails anytime in the future? This is a tough question :) Rotors and pistons already proved that some types of physics objects are very hard to implement in real time in an environment where object weights differs drastically.... so we would rather focus on other things and not do rails for now. I cannot stress how awesome you guys are for your work on Medieval Engineers and Space Engineers. I really think your weekly update plan has been a staple of your success, but doesn't it cause strain on you to finish updates within one week sprints? Bigger features take us longer than 1 week to finish, so we plan them in advance and the development of many features actually overlap. Let's say we start working on super-large world in November but we know it will take 2 months to finish. So along with this we also start smaller features that can be finished in 1-2 weeks and if you put them many in parallel, then you can still release something reasonable every week. However, oxygen and planets are not that hard as people may imagine, it will be sooner than people think. Yes, we definitely want this for ME. What are your plans for VR in Space Engineers / Medieval Engineers? Would be grand to be able to build a cockpit and fly a fighter around, or use the rift to look around in spacesuit mode. We don't have any actually development plans for VR (Oculus or any other). We think that this technology needs to get mature before it's ready for our players. Your HP says that Barbarians are coming soon, could you specify? Weeks? Months? Is it official that Tuesdays are ME patchmas days? I'm sorry that it's morbid, but I wanted to say a huge thank you to everyone at keen. Space engineers helped me get through the death of my mum. Even when I broke my hand I kept playing (albeit slowly). Thank you guys, you do great work and it makes a difference to people. My comment was just removed because it wasn't a question. So I'll ask something just because I have to. Do you play any Space Engineers for pleasure or has it just become part of the job? For Medieval Engineers it was probably the structural integrity. It's a thing where we didn't know if we will be able to make it run in real time and kind of realistic. It's not perfect yet (probably never will be) but it's kind of cool. What other planned features in Space Engineers are dependant on the "secret AI project" ? Would I be correct in assuming the Faction ships in Exploration, some or all of the scenario/campaign, better cargo ships ? This secret AI project is not for games. BTW, we will announce the project soon. Is the same team working on both games? If that's true, will affect the update speed for both games? Hi guys, thanks for the great games! Do you plan to do updates for Medieval Engineers the way you did them for SE, as a regular (maybe Thursday) event? I have to say, over the last few months Thursday became my favorite day, and have been excited each week! AFAIK they're dedicating tuesdays to ME updates and thursdays to SE updates. You guys have finally tackled the exact game concept that I've wanted to play for years. I love both SE and ME and I'm very glad to know that these games are being made by developers who love their game and roll out updates extremely consistently. My main question is this: Are you actively hiring new team members? I have looked into the application process on your website, but I was curious what skills you are looking for and what I can do to stand out as a experienced programmer. Yes we are still hiring. Every candidate receives a test from us and from there we will see if we are good fit for each other. The test is a requirement. How will you guys make the social aspect of Medieval engineers, do you think in the future we will be able to have several communities in a server who each affect each other in trading or war? Yes, factions. Just like in SE. We will need to figure out how will they communicate because there are no antennas in ME. My block textures keep on flicering from one texture to an other in ME, can anyone help me? Combination of some blocks are still not properly set, we are working on this. But it will work soon. What sources do you use when it comes to researching for both games to make sure they're scientifically and/or historically accurate? We read books, watch documentary movies, consult with field experts, talk with the community. If we could we would time-travel to middle ages. What were the decisive points in selecting the release date of ME? Why wasn't it released earlier and why wasn't it released later? I don't really remember but it was probably the shortest time we considered to be reasonable. In general we want to release things as fast as possible without sacrificing quality (too much). I love the game Space Engineers, really awesome. I've been hosting a server since the day i got it,.. seems like yesterday but also forever ago,.. :) Time flies when having fun i guess. "Will pistons and rotors ever work properly in multiplayer?" - as sad as I am to say this, I am not sure if rotors/pistons can be 100% accurate. Simulating this type of objects is a very comples physics calculation problem and we don't think it can be solved in real-time. This doesn't mean we won't try to figure it out, but it just might be impossible. Nevertheless, we are not backing down yet.